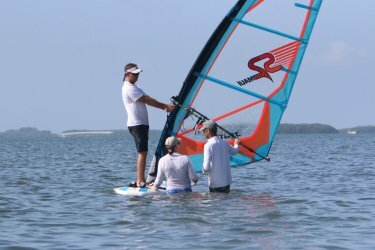 Windsurfing is a unique sport—imagine skimming across the top of the water without the sound or smell of an engine, seeing dolphins and manatees around you, and balancing against the power of the wind! Windsurfing is like flying and gives a great sense of freedom on the water. Tampa Bay has a great expanse of water, go explore it! In our beginning lesson you learn the basics. It’s similar to learning to snow ski, first you learn on the bunny hill, then progress to the green slope, and stay off the double blacks. You start off on a light wind day with calm water and a smaller sail. As your abilities and desires increase, the sail size (and the power) increases as well. Book your beginner windsurfing lessons here! 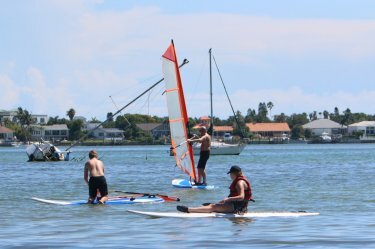 When you take a lesson from North Beach Windsurfing, you’re ready to sail around in the first hour and return to where you started to cover all the basics. The next lesson is typically a harness lesson. A harness allows you to use your weight to hold the sail so the pressure is taken off your arms. Typically these advanced lessons can happen after you've had a chance to practice what you learned in the beginning lessons for 5 or 6 hours. Harnesses are good as they allow you to use bigger sails in more wind and/or not get as tired. These lessons are 1.5 to 2 hours long and can be scheduled anytime. A beginning windsurfing lesson starts on land, so you get comfortable with what we are doing before you are in the water. We use a dry land simulator, so each skill is thoroughly explained and you get to practice it on shore before heading out on the water. We use wide boards that are easy to balance on and light sails that are easy to pull up out of the water. With our large selection of equipment, we can make sure that you are using a board and sail that is the right size for your size and the conditions. With a low student to instructor ratio, you will get plenty of individual attention, and you’ll be cruising around on your own in no time. For clothing, pick something that you are comfortable wearing in the water. Swim trunks or bikinis are fine, but you might want more protection from the sun. A lycra shirt or rash guard works well to keep you from getting sunburned, and a hat is a great idea as well. You can windsurf in bare feet or wear water shoes. If you wear shoes they should be snug fitting and stay on your feet well. Don’t forget to bring sunscreen and drinking water with you. The easy way to pull the sail up out of the water, without needing huge muscles!